Output of U.S.-specification models now is set for December, with showroom arrival planned for February. Meanwhile, Mahindra has shelved plans for a U.S. assembly plant. 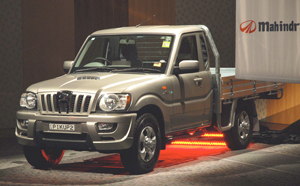 Expect Mahindra & Mahindra Ltd.’s first U.S.-market offering to make its showroom debut in first-quarter 2010. In deference to the demanding nature of American consumers, Mahindra tweaked the yet-unnamed small pickup, which delayed by about three months its production launch, Ward’s learns. Output of U.S.-specification models now is set for December at the auto maker’s assembly plant in Nasik, India, with showroom arrival scheduled for early to mid-February. Meanwhile, Mahindra has shelved tentative plans to build the 2- and 4-door models, known internally as TR20 and TR40, respectively, in Ohio. Domestic production “is something that is on the agenda to be pursued at another time,” says Larry Daniel, senior vice president-sales and marketing, of Mahindra’s U.S. arm, Global Vehicles U.S.A. Inc. In a telephone interview from Global’s headquarters in Alpharetta, GA, Daniel tells Ward’s he expects Mahindra to “make an investment and employ some Americans” when industry volumes begin to trend upward. Through June, small pickup sales in the U.S. totaled 131,290 units, a shortfall of 43.1% compared with the first six months of 2008, according to Ward’s data. Target volume for Mahindra reportedly is in the 50,000-unit range. To make the truck more appealing to U.S. consumers, its front end was restyled and now features “jewel-like qualities,” adds Max Butler, Global vice president-marketing. The U.S.-specification truck closely resembles the model launched last week in Australia, he says. The truck will be powered by a 140-hp 2.2L 4-cyl. diesel engine with projected combined city-highway fuel-economy of 30 mpg (7.8 L/100 km). Available with 2-wheel drive or 4-wheel drive, it also will feature a 6-speed automatic transmission and electronic stability control. Despite a 2,633-lb. (1,194-kg) payload rating that rivals the fullsize Ford F-250 Super Duty – Ford Motor Co. data show four trim levels with payloads under 2,600 lbs. (1,170 lbs.) – Daniel anticipates outdoors enthusiasts will outnumber work-oriented buyers 3:1, with the latter demographic gravitating toward the 2-door model. Steve Taylor, president of Ohio-based Taylor Automotive Group, is one of more than 300 dealers who look forward to selling Mahindra vehicles. “We’re thinking we can lease (the pickup) to small businesses,” Taylor tells Ward’s, adding the diesel engine likely will become a selling feature as gasoline prices increase. The per-gallon average price of diesel fuel in the U.S. was $2.58, $0.06 higher than the pump price of gas, according to the American Automobile Assn. But diesel engines are 20% to 30% more efficient than their gasoline-burning counterparts. Particularly enthusiastic about the prospects of Mahindra SUV expected to arrive in mid- to late-2010, Taylor also is buoyed by results of an AutoPacific study that says American consumers are warm to an Indian-brand vehicle. “It’s a world market and it’s on a roll,” he says. The study findings are consistent with Mahindra’s vision of a customer base that comprises “independent thinkers,” Daniel says. Daniel does not expect the names TR20 and TR40 to pass muster within Mahindra’s marketing ranks because of its similarity to Toyota Motor Corp.’s TRD trim levels. The Toyota Tacoma, along with the Nissan Frontier and Dodge Dakota, are among the trucks Mahindra is targeting as direct competitors. Daniel favors the Australian nameplate: Pik Up. “That hit me and I like it,” he says, promising Mahindra’s pricing strategy will “blow away” the segment. However, Daniel does not reveal numbers. The U.S. truck will come with a 4-year, 60,000-mile (96,560-km) warranty.